o Geo-engineering is one outgrowth of our apparent learning disability about the law of unintended consequences. That law would be unleashed full-force once we started manipulating the oceans and atmosphere to create what one environmentalist calls “the Frankenplanet”. Geo-engineering is like a grownup version of whack-a-mole, where hammering down one problem causes others to pop up, to our great surprise. The type of geo-engineering I’m dissing here includes a variety of ambitious proposals such as dumping iron into the oceans to create huge blooms of algae to absorb carbon dioxide; spraying seawater into the sky to encourage cloud formation; and injecting sulphate particles into the atmosphere to reflect more sunlight into space. My favorite is the space umbrella – a giant parasol deployed above the Earth to shade us from the sun’s rays. According to The Economist, geo-engineers like this option because it’s the most “scalable”. In other words, if the atmosphere gets hotter, we can increase the size of the umbrella. Researchers calculate that an umbrella half the size of Brazil could offset half the warming expected over the next 100 years, assuming no cuts in greenhouse gas emissions. Trying to conquer these downsides is great fun in the lab, but in real life we’re talking about the planet’s hospitality to living things, some of them sentient. But what bothers me most about geo-engineering is this: It provides an excuse to avoid a profoundly important teachable moment. Climate change is painful proof positive that we are connected with and dependent upon the rest of the natural world. It tells us that our time as outlaws is over; we have reached the limits of the planet’s capacity to tolerate abuse. Global climate change calls for an evolutionary shift in consciousness first, and technology second. And the technology we need is eco-engineering, not geo-engineering. If we deny this moment and fail to “institutionalize” the revelation of connectedness in our science, engineering, policies and behaviors, we will have demonstrated for all time that 1) we are the ultimate invasive species, and 2) we are not the most intelligent species, and 3) when it comes to our own survival, we have no more willpower than lemmings. In fact, this is more than a teachable moment. It’s a moral moment because the lives we are affecting are virtually all species, all people including those least able to cope with climate change, and many generations of human beings to come. I don’t think that civilization is at stake with global warming. But I think that loss of the natural world we care about is at stake…As much as I sometimes wish we could find a civilization-wrecking outcome from global warming, because that would force people to cut emissions very quickly, I don’t believe there is one. I think humans are amazingly adaptable and have amazing powers of isolating themselves from the environment by their technology, and those powers are not going to go away. And even human wants are very adaptable. So while I’m not claiming there won’t be bad impacts from global warming — of course there will be, I spent my whole lifetime writing on that topic — I don’t see it as a civilizational threat. We can argue about the definition of “civilization” and whether climate change is a civilizational threat, but what’s most disturbing is that a respected climate scientist believes that human well-being and the health of the biosphere are not necessarily connected – that if we bring about the “loss of the natural world”, we humans will get along just fine. Technology will come to our rescue. I’m not sure we have the technology to become a bubble-species. 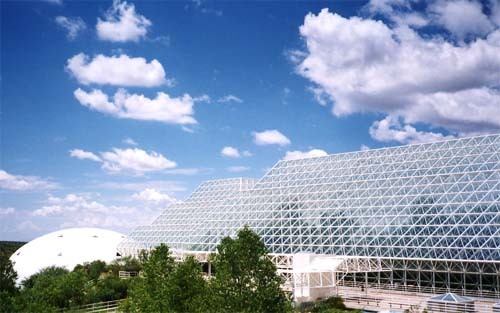 If we did, I assume Biosphere 2 in the Arizona desert would still be somebody’s home rather than a tourist attraction/research facility. But even if we had the ability to live without the natural world, would it qualify as living? Would we keep our souls if we were permanently unplugged from the rest of creation, or what was left of it? To qualify for these funds, you must first demonstrate that you have learned to understand “the accumulated evolutionary wisdom” (the Economist’s phrase) in natural systems. Until you can produce a fiber as strong as a spider’s silk, for example, you have not shown that you are better engineers than nature. Come back when you can show us how to protect our coastlines as well as natural systems once did and to prevent flooding as well as riverine ecosystems did before we destroyed them. Come back when you have learned to build a levee that doesn’t fail and when we’ve shown a sufficient attention span to keep our bridges from falling down. The geo-engineering projects you envision will require diligence forever, a level of commitment we have not yet demonstrated. Come see me when you have created buildings that produce more energy than they use, cities that do not sprawl, and power plants that don’t pollute. Show us the engineering solution to lifting the world’s people out of poverty without bankrupting our natural capital. Come back when you have stopped trying to be god-like and you have learned to be child-like, filled with wonder and curiosity at the natural world and anxious to learn what billions of years of evolution can teach us. Come back when you have the humility to acknowledge that your true laboratory is not in a building, but in the biosphere itself. We don’t have to be Luddites to draw the line at geo-engineering. There has never been a more urgent need, or more fertile ground, for intelligent invention. But for both moral and pragmatic reasons, invention must help us fulfill our potential as residents of the natural world, rather than striving to “live” apart from it.